Draper of the Borough . . . . and wife murderer? Silvester Peters was born in 1828 at Worle, Kewstoke, Somerset, and baptised at St Martin's church, Worle on 19 October 1828. He was the son of farmer and dealer in pigs George Peters (1798-1879), originally from Congresbury, Somerset, and Jane née Anderson (1795-1874). In the 1841 census George and Jane were living in Worle with their children; James (b1821), Louiza (b1826), George (b1826), Simon (b1827), 12-year old Silvester, Anne (b1831), Edwin (b1833), John (b1835) and Mark (b1837). George described his occupation simply as a farmer. On the night of the 1851 census only George, together with sons Silvester, Edwin, John and Mark, were at home. George gave his occupation as a 'Farmer of 30 Acres' while Silvester listed his as a Licensed Hawker. In the autumn of 1852, at Axbridge, Somerset, Silvester married Sarah Bailey. They initially lived in Corsham, Wiltshire where their son, Frederick J, was born in 1856. Silvester and Sarah then moved to Yeovil where they had two further children; Augusta Matilda (b1858) and Alice F (b1860). By this time Silvester was trading as a draper and had a shop in the Borough (see photograph below) above which was his family's living accommodation. Sarah, however, was not a well woman. She was in the primary stages of consumption but for many weeks during the spring and summer of 1860 the 28-year old suffered from intermittent, but severe, bouts of sickness, diarrhoea and stomach cramps. She was attended by Dr Garland who suggested she was suffering from "intense irritation of the stomach and bowels of an obscure nature". Concerned for her wellbeing and puzzled by the irregularity of her symptoms, Dr Garland sent a sample of Sarah's urine to an eminent Bristol Professor of Chemistry and an expert toxicologist, William Herepath who discovered the poison antimony in the sample. On learning of this, Dr Garland informed the Superintendent of Yeovil Police. Dr Garland was called to the Peters' home during the evening of 4 July 1860, to discover Sarah with agonising stomach pains. The doctor attended her throughout the night but she died the following morning. Because of his concerns over the cause of her demise, Dr Garland refused to issue a death certificate. A Coroner's inquest was held at the Mermaid Hotel on Saturday 7 July but, after hearing evidence of Dr Garland concerning the discovery of antimony in the urine sample, the Coroner adjourned the inquest and ordered a post mortem examination be carried out. This was performed under the scrutiny of several local physicians and the inquest was resumed on 25 July 1860. In brief, Sarah Peters had serious internal problems and it was concluded that she died from peritonitis. However it was also concluded that the peritonitis may have been caused by, or exacerbated by, the presence of antimony despite there being no traces of the poison in the body at the time of the post mortem examination. The Coroner's inquest jury concluded that "Sarah Peters died from a complication of disease accelerated by the presence of some irritant, but how and by whom administered there is no evidence before the jury to show." The full report of the inquest, from the 13 July 1860 edition of the Western Daily Press, is shown below. With an inconclusive verdict, Silvester Peters returned to the day-to-day business of running his drapery business. He was listed as a "Linendraper of High Street" in the 1861 edition of the Post Office Directory - his only listing in a Yeovil trade directory. In the 1861 census Silvester was listed living above his shop premises in the Borough and describing himself as a Draper. Living with him were his three-year old daughter Augusta Matilda, a 26-year old visitor Matilda Bailey described as a 'Lady', together with a shopman and a domestic servant. During the following decade Silvester Peters moved from Yeovil - perhaps encouraged by wagging tongues over the mysterious death of his wife or his relationship with Matilda Bailey. Certainly by the 1871 census Silvester was living at 64 Bernard Street, Southampton, Hampshire. He gave his occupation as a draper and living with him were his 'wife' Matilda (I could trace no record of their marriage) and his three children by Sarah. By 1881 he had moved his family to 22 Bernard Street (possibly a street re-numbering) and was listed with Matilda, their 8-year old daughter Eva Sarah (b1873) and his niece Clara, who acted as an assistant in the drapery. By the time of the 1891 census Silvester, Matilda and Eva were still at 22 Bernard Street and 62-year old Silvester was still working as a draper. It appears that Matilda died in Southampton in 1892 but I couldn't find the death record for Silvester. The entry of Sylvester Peters' baptism of 19 October 1828 in the Worle parish register. 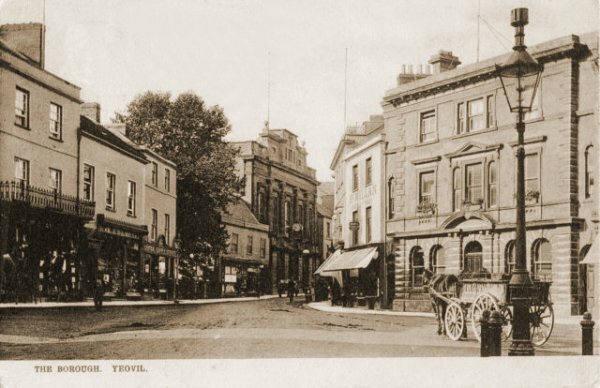 Judging by the size of the tree in the front garden of the Bell, this postcard of the Borough looking west to High Street dates to about 1900. In the 1860s Sylvester Peters' shop premises, with his living accommodation above (and where his wife died), was the building with the wrought iron balcony at extreme left. Below is the full report of the inquest into the death of 26-year old Sarah Peters, from the 13 July 1860 edition of the Western Daily Press.